When I woke on our fourth day, it was lighter than I expected. I snaked my arm out of my mummy bag to look at my watch. 7:15! 45 minutes later than I had set my alarm for. Obviously, something was wrong with my watch. I woke Alyssa up and told her that we had to get going, hurriedly explain what happened with the watch. “No,” she explained, “there’s nothing wrong with your watch. 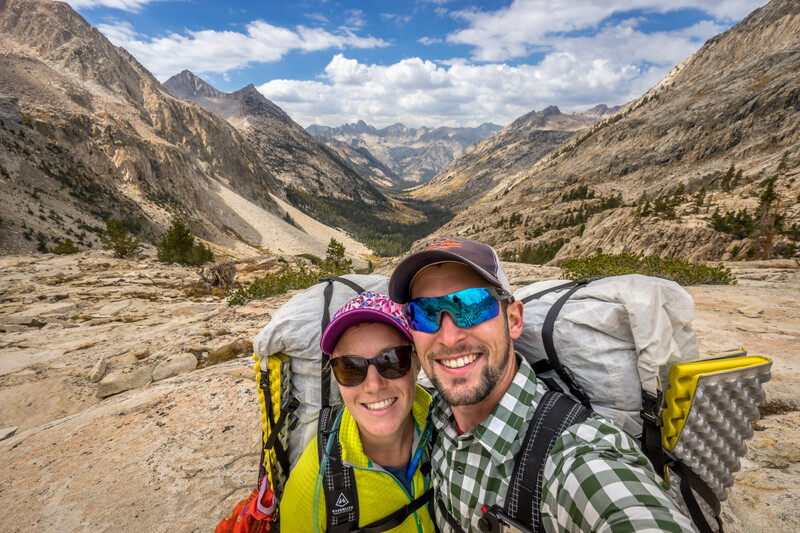 The alarm has been going off for 45 minutes and you didn’t wake up so I thought you needed the sleep.” Not one to ever sleep through my alarm, I was shocked to hear just how exhausted I was at this point in our trek. The JMT was taking more of a toll on us than I expected. We packed camp quickly, taking the time to shake off the tent which had sheltered us from some significant rain the night before, and were on our way. Fortunately for us, the weather had cleared after the storm, leaving us with a beautiful, but cold and frosty morning. We hiked for about an hour before we finally emerged from the shadows of the peaks to our east, stopping in the first patch of sunlight we encountered. It’s amazing what a bit of sun does for your body temperature – minutes before we had been shivering in base layers, mid layers, puffy jackets, hats and gloves; but once we hit the sun it was a race to get everything off before we overheated. We basked in the sun for a good twenty minutes, enjoying the warmth and a quick breakfast to get us fueled up for the trip over Mather Pass. 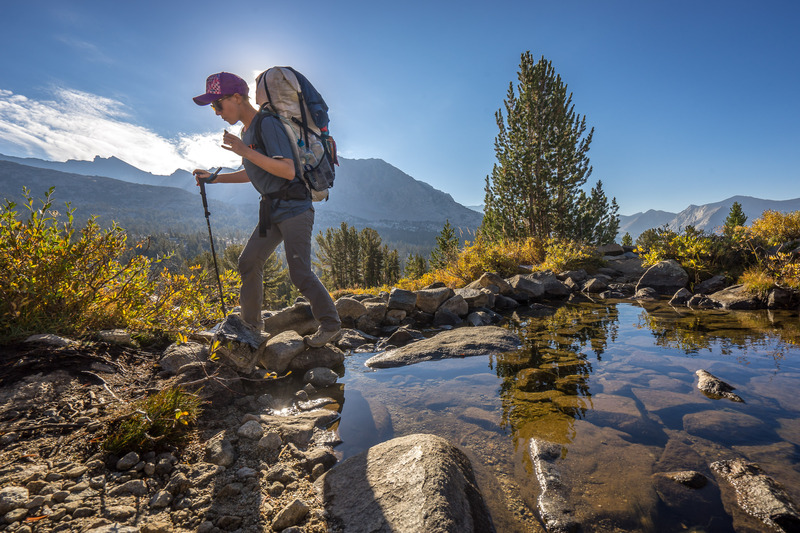 Crossing a small creek on the approach to Mather Pass. Finally feeling warm for the first time today! Along the way we passed another couple who were also enjoying the warm sun. After a brief hello we continued on our way, only to hear them calling after us as we left. 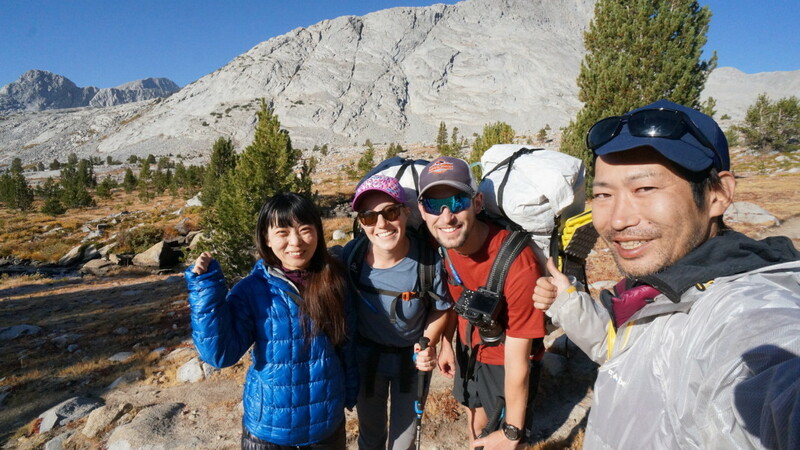 Turns out they had come all the way from Japan to do the JMT for their honeymoon, as well! They were headed south, so we wouldn’t see them again, but it was fun to connect for a minute. Issei and Maiko, our fellow trail newlyweds! Now that we were fed and clothed appropriately for the day’s hike it was time to figure out exactly what our plan was for the rest of the trail. We discussed the options as we climbed toward Mather Pass. Both plans that we came up with the day before hinged on us making a decision by the end of the day today at the trail junction in Le Conte Canyon. To recap – we knew that our original plan of 25 to 28 miles per day was too ambitious. Alyssa’s feet were bruised and sore from the wedding when we started the trip, and the miles we’d hiked so far had only worsened the issue. Because of this and a host of other issues, we were moving slower than we’d anticipated… about 2 – 2.5 mph instead of 3 mph. If you do the math on that, we’d need to hike roughly 14 hours (without stopping) to make a 28 mile day. When you consider that we were only getting 12 hours of daylight and had a possibility of some winter weather coming through, the deck looked stacked against us. 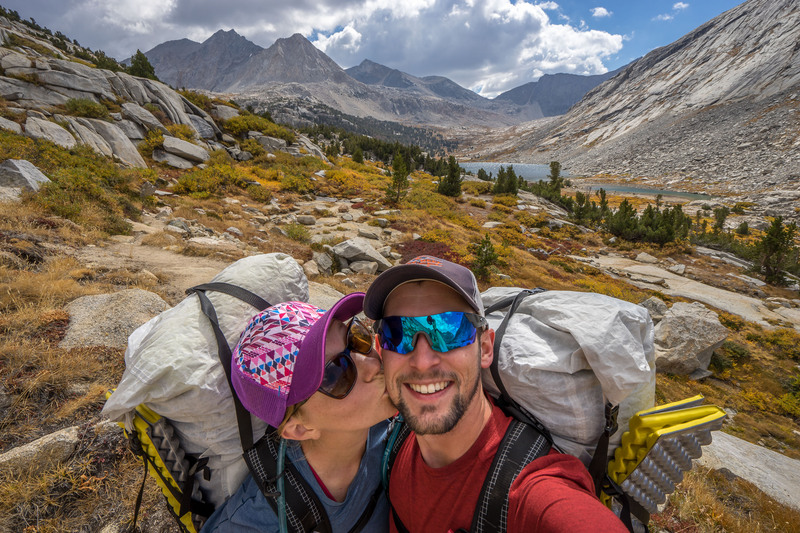 Continue on on the JMT towards Muir Pass for four more days, hike out at Red’s Meadow (into Mammoth) on day 9 and take a YARTs bus into Yosemite on day 10, to make our reservation at the Ahwahnee. Even with slightly easier mileage than we originally planned, this was going to be a tough few days of hiking. This was the loftier of the two options and depended on us feeling pretty good and the weather hold out so we could make our miles. 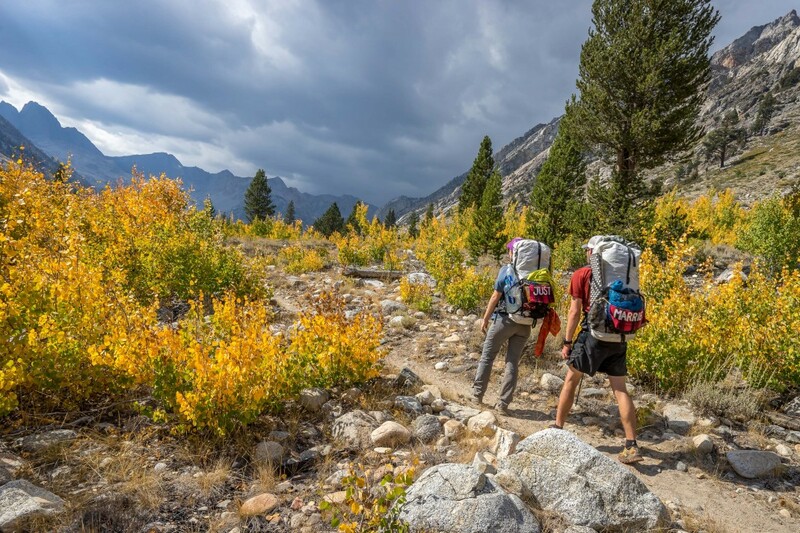 Hike out at Bishop Pass, catch a ride from Bishop to Mammoth, relax in Mammoth for the weekend, then hop back on the trail for a final 3-day hike from Mammoth to Yosemite, finishing on day 10. 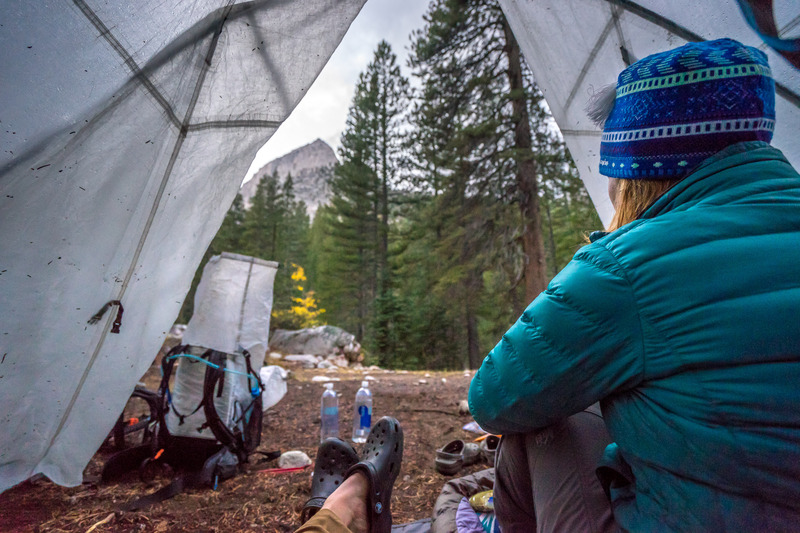 This option would give us a few days to relax and recover in Mammoth, the opportunity to take a look a weather forecast in case anything big was blowing in, and still plenty of time to make our Ahwahnee reservation. As we walked towards Mather, we weighed our options. On one hand, pushing through would feel like such an accomplishment. 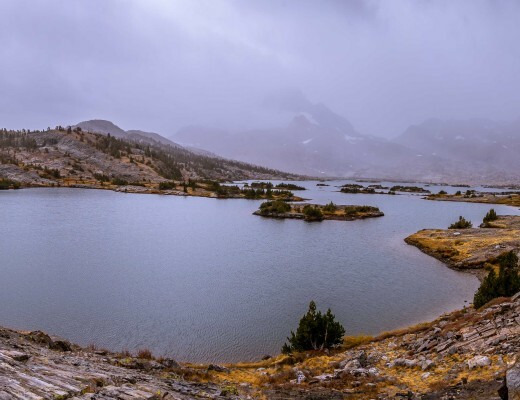 On the other hand, the weather seemed to be getting worse day by day and Alyssa’s feet were really giving her trouble – maybe a day off would give them time to recover, making the second half of the hike more enjoyable. Ultimately we decided to hold off on making a decision until the end of the day, making the call from Le Conte Canyon this evening. 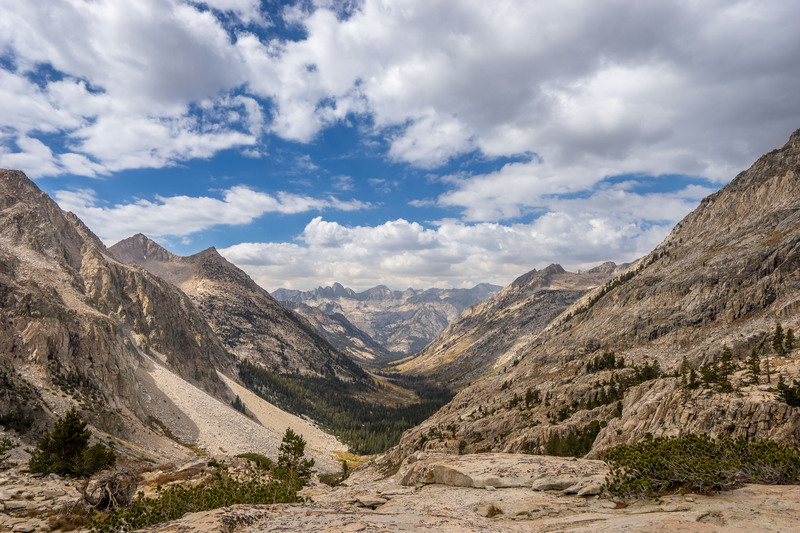 The weather was looking good at the moment, but if a storm rolled in and slowed us down, the decision to go out over Bishop Pass would be a lot easier to make. The approach to Mather Pass. 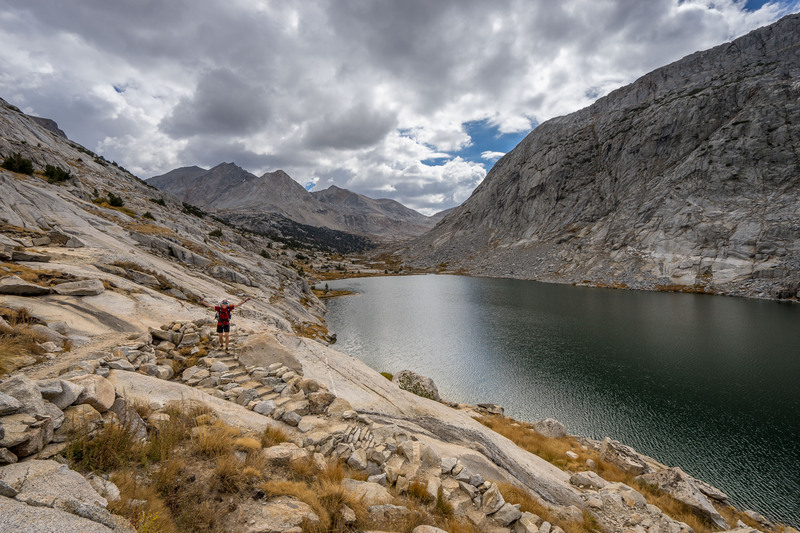 Another John Muir Trail moonscape! By the time we had puzzled through all of our logistics, we had done most of the hard work on Mather Pass. A few more switchbacks brought us to the top and we settled down for some more breakfast and a cup of hot coffee. The views toward Palisade Lakes were spectacular! 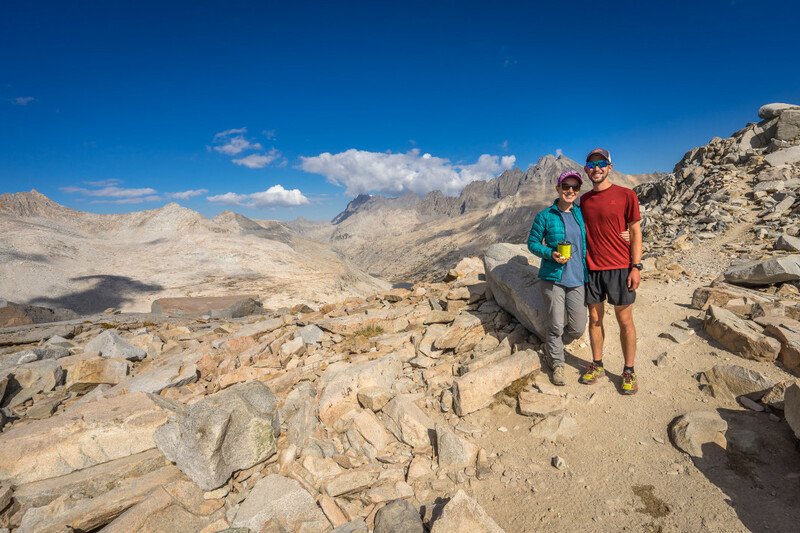 Celebrating an early morning achievement at the top of Mather Pass. Woohoo! We took our coffee to go, repacked our packs, and dropped off the other side of the pass. The trail here snaked through an expansive boulder field, where the only available trail building materials had been softball sized rocks. These “baby heads” proved difficult to walk on, especially for Alyssa who is very careful about not wanting to twist an ankle after her accident in the spring. We took our time down the pass and then picked up the pace again once we were back on solid ground. Mather Pass and Palisade Lakes back behind us. As we rounded Palisade Lakes, we noticed that the clouds were starting to build again. It was still early in the day, but already starting to look like rain. We asked every hiker we passed if they had an updated weather forecast – no luck. In fact, they mostly responded that they were hoping to get the forecast from us! More beautiful views at Palisade Lakes. Definitely starting to look like rain! The trail began another long descent north of Palisade Lakes. Before dropping down, we stopped for some lunch and a quick water refill. 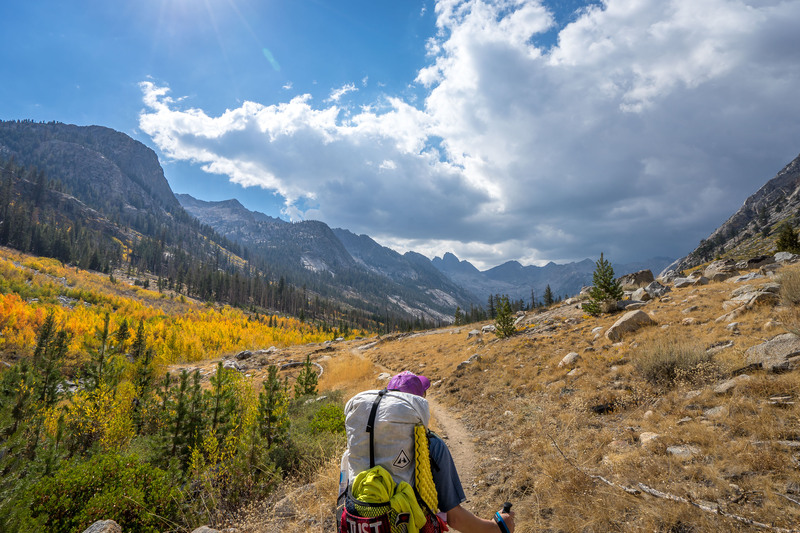 As we snacked, a group of southbound hikers came through looking a little worse for wear, and for good reason: they had just climbed the Golden Staircase. 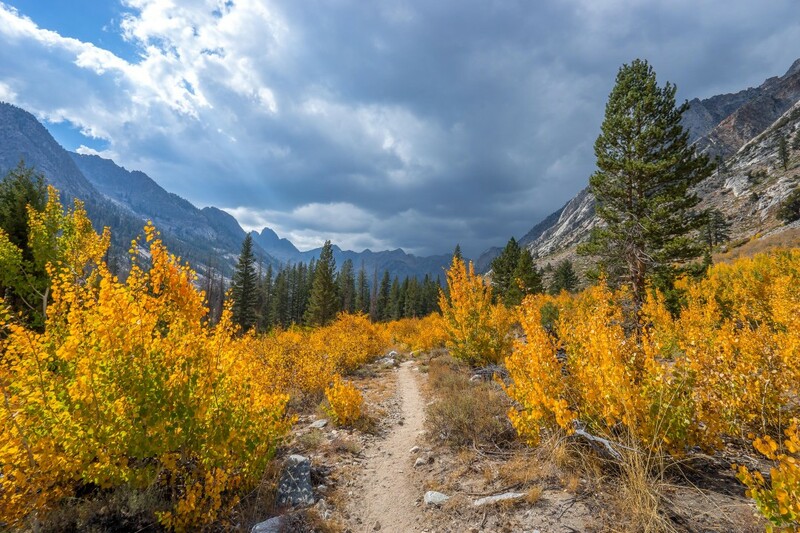 The John Muir Trail is known for its tough mountain passes. 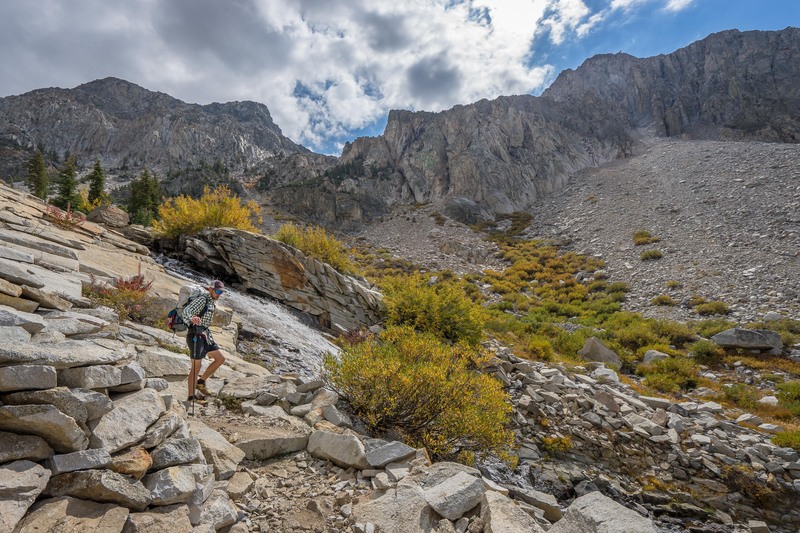 While the Golden Staircase isn’t technically a pass, it stands out as one of the most difficult climbs on the trail and is the only non-pass section of the trail with its own name. Luckily, as northbound hikers, we had already done our hard work for the day and would be hiking down the Golden Staircase. 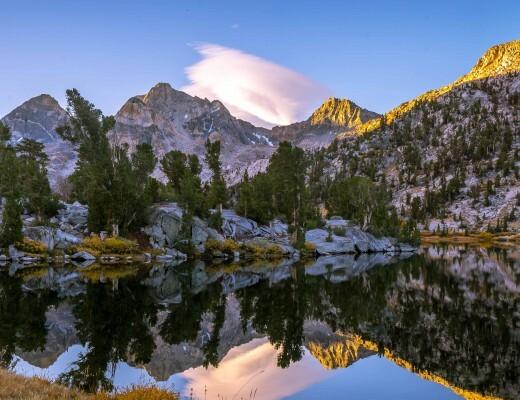 That’s definitely one advantage to hiking the JMT in this direction! The landscape opened up again around the next bend in the trail. We were at the top of the Golden Staircase and the views into the valley below were the best we’d seen so far. The view from the top of the Golden Staircase. Amazing! Waterfalls still flowing, even at the end of the September! We made quick work of the staircase and continued on along the valley floor. The colors on the Aspen trees here couldn’t have been any more perfect – their golden leaves creating breathtaking contrast with the blue sky and dark rain clouds building above. At the bottom of the valley we hit a trail junction and turned up toward Le Conte Canyon. Only 2 more miles to our camp for the night! Just as we left the trail junction, the clouds finally let loose. We took shelter under a stand of trees and waited for the worst of the (hopefully quick) storm to pass. After about 30 minutes under our shelter, the rain let up a bit and we were back on the trail again. The views around us became progressively more impressive as we entered Le Conte Canyon. 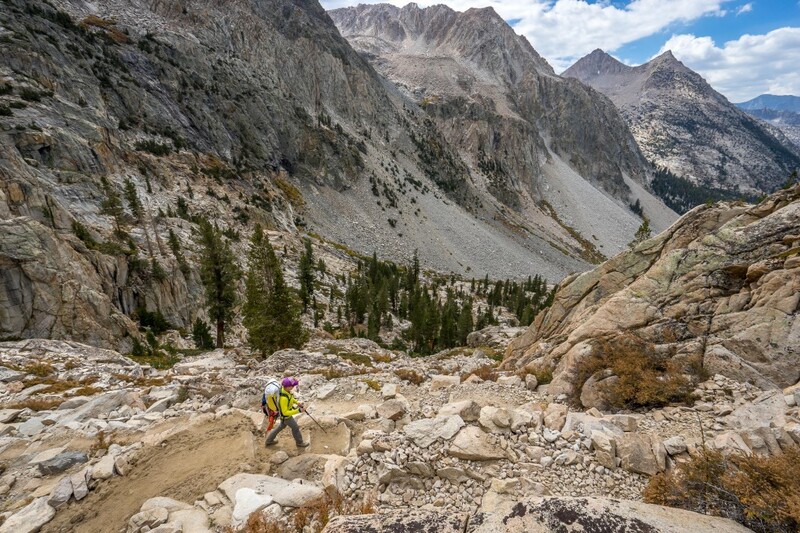 The granite spires towering above made us feel like we were walking into our own private Yosemite Valley. The Citadel, pictured in the background, is one of the most beautiful features in Le Conte Canyon. 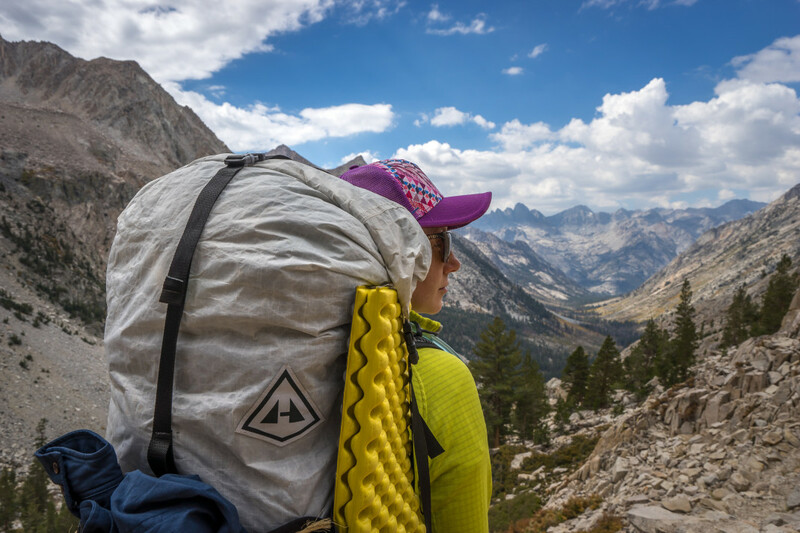 The Alyssa, pictured in the foreground, is the most beautiful person in Le Conte Canyon. Eventually we pulled up to the Le Conte Ranger Station at the Bishop Pass trail junction. The ranger was long gone and the cabin was locked up tight for the season. While we set up camp and prepared dinner, we talked about the day and reflected on our time on the trail so far. After some discussion, we came to the conclusion that we’d be hiking out over Bishop Pass in the morning. 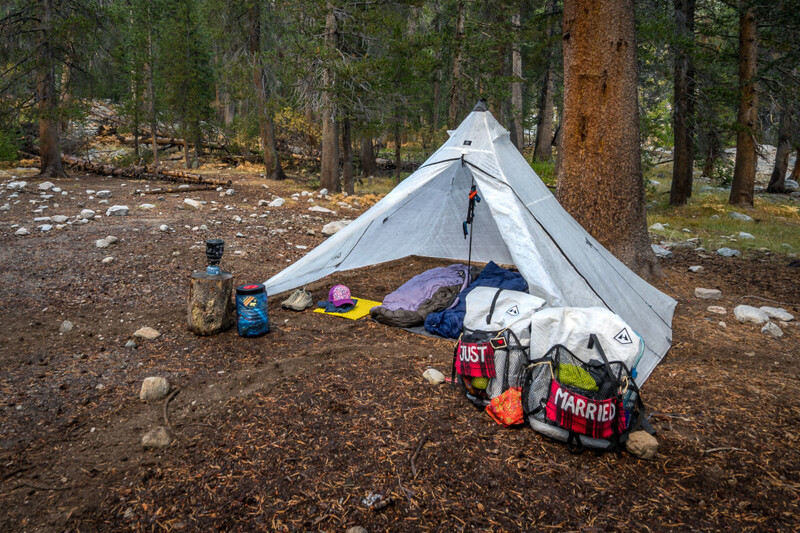 Our Le Conte Canyon camp setup for the evening. Not a bad view from the tent! It’s never fun to come to terms with the fact that you aren’t going to complete an objective, and Alyssa and I were both feeling pretty bummed about it this evening. However, I think making this call was a great learning experience for both of us, something that we’ll look back on in the future as a moment of teamwork in a trying time. Check back soon for details on the rest of the trip!